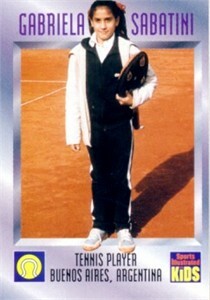 1996 Sports Illustrated for Kids tennis card of former WTA Tour star Gabriela Sabatini of Argentina showing her as a little girl. NrMt-Mt or better condition (usual perforations). ONLY ONE AVAILABLE FOR SALE.